We saw a Dr. Jekyll and Mr Hyde performance from one of my rock gods last night. 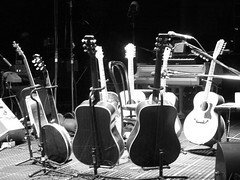 Neil Young walked out and sat down alone in the middle of these guitars last night and did a one hour acoustic set. He started with Hank To Hendrix and ended with Heart Of Gold. The highlight for me was when he grabbed his banjo and did Mellow My Mind. Thanks Neil, I needed that. 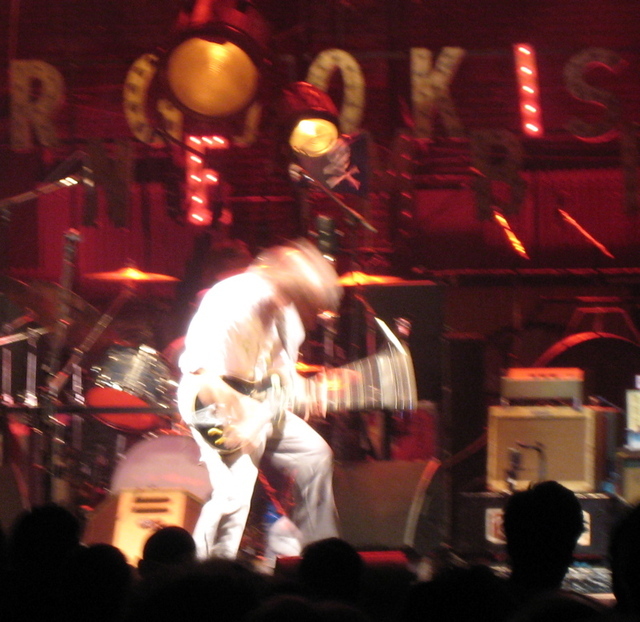 Then after a 20 minute intermission, he came back with his black Les Paul strapped on and unleashed a torrent of rock and roll that is still ringing in my ears. The finish was a 10+ minute version of Hurricane that proved to me that Neil has lost nothing. I was blown away. Here’s a photo I took of Neil wailing away during one of about five solos during Hurricane. It’s something to see a 60 year old rocker go at it like that.